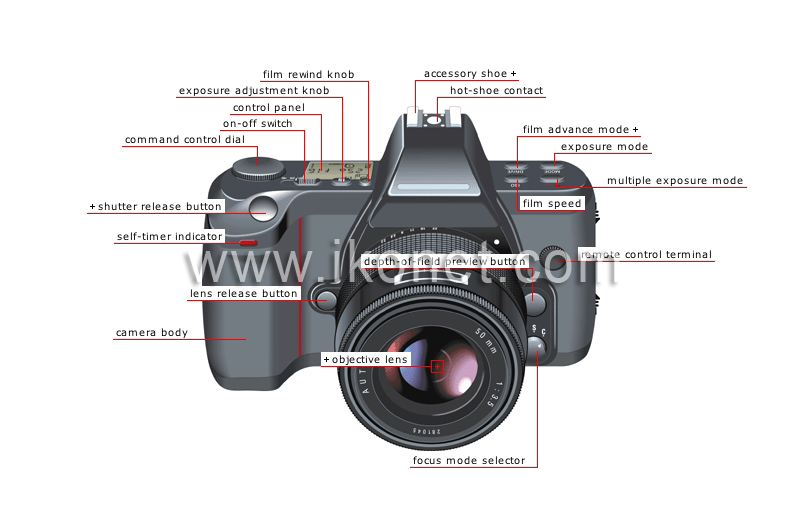 Still camera with an interchangeable lens that can be used for both viewing and shooting, hence the term "e&reflex"e&. Button that allows the user to choose between an automatic or manual focus to ensure a clear image. Button that closes the diaphragm so that the relative clarity of various depths can be seen through the viewfinder. Optical system made up of a set of lenses fixed on a mount; it allows a clear image to be produced on film. Button for removing the lens from the camera body. Rigid sturdy box that contains the camera’s mechanism and shields the film from light. Button that controls the exposure through control of the focal plane shutter opening. Light that shows the self-timer is on to delay release of the shutter; this allows the photographer to be in the photo. Button for choosing an automatic, semiautomatic or manual setting to control the amount of light that comes in contact with the film. Control button that blocks the film from advancing to create multiple exposures (several images superimposed on the same frame). Control button that sets the film’s sensitivity to light as expressed by the ISO or ASA number; the higher the number, the more sensitive the film. Control button used to advance the film in the camera body (frame by frame or continuously). Conduction unit that links the camera’s electronic circuitry to the accessory mounted on the accessory shoe. Device for attaching an accessory to the camera (usually an external flash). Dial used to adjust the various parameters of a mode. Knob that can deliberately underexpose or overexpose a film when the camera is in automatic exposure mode. Liquid crystal display that shows the camera’s various settings. Control knob for rewinding a totally or partially exposed film back into its cartridge.